What is a z-score table? Z-score is a value used to describe the normal distribution. It is defined as the distance between the mean score and the experimental data point, expressed in terms of SD (standard deviation). In statistical data analysis, it is also called standard score, z value, standardized score and normal score. where x stands for raw value, and n for the number of data points. Let's assume a following task: during a test, four students scored 50, 53, 62 and 70 points. What is the z-score of the result 62? Find the mean of the results. μ = (50 + 53 + 62 + 70) / 4 = 58.75. You can also use our average calculator to do it. Input these results to the z-score equation for x = 62: z = (62 - 58.75) / 7.854 = 0.41. You just found the z-score of 62! 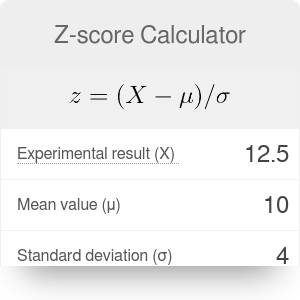 You can also use the z-score calculator to find the mean or standard deviation if you know the z-score. A z-score table is where you can find the area to the left of the given z-score under the standard distribution graph. The first column of the table is a list of z-values (accurate to one decimal place). In the first row, you can find the digit that is on the second decimal place of your z-score. For example, we found the z-score of 62 in our example to be equal to 0.41. First, you need to find z = 0.4 in the first column; this value shows you in which row you need to seek. Then, find the value of 0.01 in the first row. It will determine the row in which you must look. The area under the standard distribution graph (to the left of our z-score) is equal to 0.6591. Remember that the total area under this graph is equal to 1. Hence, we can say that the probability of a student scoring 62 or lower on the test is equal to 0.6591, or 65.91%. Knowing this area, you can also find the p-value - probability that the score will be higher than 62. It is simply 1 - 0.6591 = 0.3409, or 34.09%. Z-score Calculator can be embedded on your website to enrich the content you wrote and make it easier for your visitors to understand your message.